scottish oatmeal | What Am I Eating? If you read any of my other blog posts, you will notice the word mom mentioned many times. This post continues my theme of mom-inspired creations, which may never end. Sorry if you tire of hearing about this wonderful woman, but her hard-working example in the kitchen made me who I am today, a lover of food, cooking, and all things culinary. She ruined me for many things, including her famous apple pie (I may never even attempt to replicate her specialty) and also pancakes. Rarely did her pancakes drip with maple syrup. Her homemade oatmeal pancakes came with a variety of toppings. Applesauce, peanut butter, berries, jams, whipped cream and her simple berry syrup made from apple juice concentrate, frozen berries and corn starch. Mom taught us to cook as soon as she could, and pancakes topped the list of items we enjoyed helping her make. No Krusteaz or Bisquick for her, just a few fresh ingredients in a bowl and an electric griddle. It is her fault I am a pancake snob. Yet, I am sure she would not complain about me blaming her for that. I never order pancakes from a restaurant. Restaurant pancakes rarely taste like anything other than white flour and grease from the over-used griddle. Spongy rounds of dough made from prepackaged mix do not appeal to me. Why buy them when I can make them better? I often say that I never make the same recipe twice. I enjoy experimenting and trying new versions of the same classics. However, I found my new favorite pancake recipe a few days ago. A recipe destined to fulfill my pancake cravings for years to come. No more searching the internet in vain for new pancake inspiration. I found pancake heaven. Filled with whole grains, low in fat and sugar, and even great reheated! My kind of recipe. They may even threaten the popularity of the homemade waffles that typically fill my freezer. 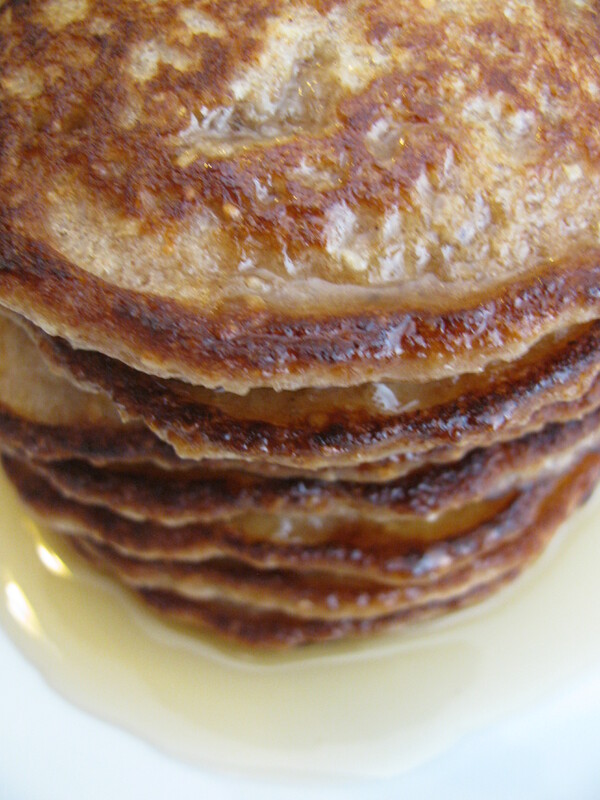 I adapted this recipe from Flaxseed Meal Pancakes from Bob’s Red Mill. When looking for a whole-grain recipe, I typically start with Bob’s. I highly recommend anything with his smiling, bearded face on the label. Sift together the flour, salt, baking powder and cinnamon. Add the oatmeal and flax-seed meal. In a separate bowl combine the milk, maple syrup, egg and vanilla. Stir the wet ingredients into the dry, and combine. Do not over mix, or the pancakes will be tough. The batter should still be lumpy. Heat a non-stick skillet (or electric griddle or whatever you cook your pancakes) over medium heat. Drizzle one teaspoon of olive oil in the pan, and then add the pancake batter, in 1/4 cup portions. Flip when the edges of the pancakes start to dry and bubble. These pancakes may take longer to cook than the typical pancake recipe, because of the whole grain ingredients. Cook the pancakes until cooked through (the pancake should feel spongy and springy when you touch the middle of it). Do not flip the pancakes over again! Flipping them again will only dry out the pancake. This goes for all pancake recipes. Remove them from the heat and continue with the rest of the batter. Eat immediately, or refrigerate for a quick breakfast later in the week. Much better fresh, of course, but I don’t feel like cooking at 4:30 in the morning, so sometimes I make a huge batch of these and grab one as I run out the door. Great bus stop food! Minus the toppings, of course.